As the owner of a rental house with tenants living in it, you are completely in charge of deciding when to sell it. But the sale will be subject to certain conditions. There will be legal considerations, based on the lease and on the law. And there will also be the tenants’ right to quiet enjoyment of their leased property, another provision in residential leases. 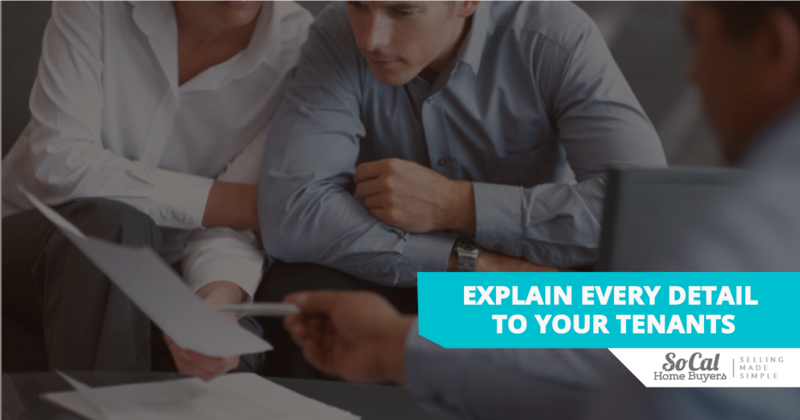 Understanding what’s in your lease agreement and following the terms is the best way to get started when you decide to sell your house. 1. Under What Circumstances Can You Sell Property with Tenants? Assuming you and your tenants signed a lease before they moved into the house, it’s easy to find the termination date because it’s usually on the first page of the lease. Tenants have a right to live in the rental house, which is now their home, until the stated termination date. That’s true whether you own the house or not. If you sell it to a new owner, they are buying the lease along with the house, and they must honor the terms of the lease with the existing tenants. Investors want the rental income and don’t plan to live in the house themselves. But it’s possible that your buyers want the home for themselves someday. In case your tenants and the new owner agree to terminate the lease at any point, that is a separate arrangement between them, and it does not involve you. Their agreement to terminate the lease may occur before closing or at any time after closing. Sometimes a new buyer will compensate the tenants for the trouble of moving out before their lease expires. Any deposits and rents paid in advance to you will be credited to the new buyer at closing, and they’ll be refunded to your tenants when they move out of the house. 2. What’s the Law Covering a Home Sale Including Tenants? If you had a lawyer create the lease between you and your tenants, check with him or her to understand all the laws governing your lease and affecting a sale of your rental property. 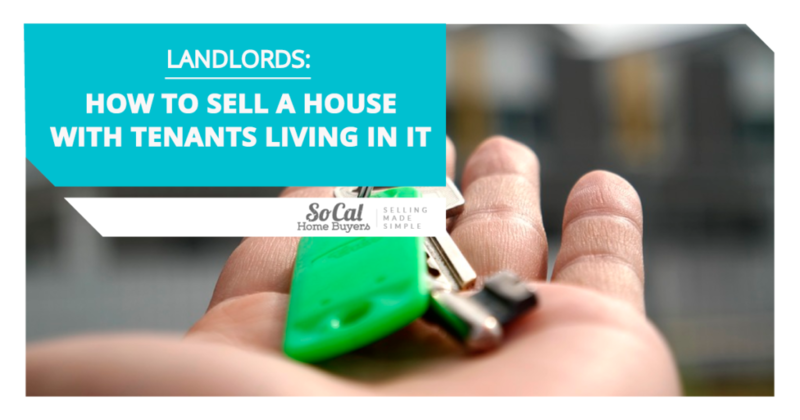 If you created the lease with a form you found online, or one you obtained locally, you will still be obligated to meet federal, state, county and city laws regarding the sale of home with tenants living in it. If your original lease has expired and you didn’t provide a written lease extension form for your tenants to sign, they are living in the house on a month-to-month basis. California law covers month-to-month tenancy, and it specifies when and how the landlord and the tenant must notify each other to end it, from either side. A month-to-month lease gives the tenant the right to live in the house from the anniversary date of the original lease (the day of the month it was originally signed) on an on-going basis, one month at a time. California tenants under these terms must be given notice before the 1st of any month to end their lease by the last day of the following month. That’s called “Sixty Days’ Notice,” which is required for tenants who have lived in the house for a year or more. Naturally, your tenants need to know about any plans you’re making to sell their home. Set up a convenient time to stop by and speak to them in person, preferably both the husband and wife in a married couple and all the roommates in a co-tenant arrangement. It’s important that you speak to each person who lives in the rental house, even long-term guests. Preparing a written notice to leave in the property after your visit with everyone is another way to make sure you’ve met your legal notice obligations. And you can always send written notice by mail, in addition to meeting with everyone living in the house. You will definitely need your tenants’ cooperation for showing their home, whether you list your rental property with a real estate broker or set up showings to sell it yourself. In either case, the tenants must be notified in advance, ideally in writing. 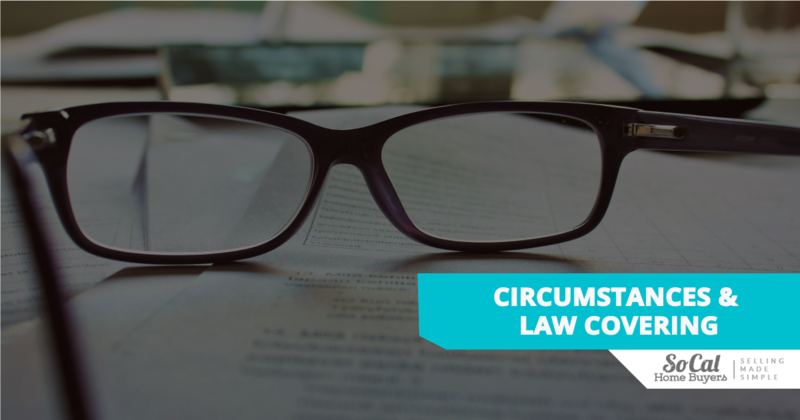 Check your lease terms or ask your lawyer to determine whether a phone call or a text is enough to provide tenants with legal notice. Once again, be prepared to send them a letter in the mail. You or your real estate broker may choose to hold open houses to market the property. Tenants will need to leave home on that day and stay away during the advertised open house hours. Due to the inconvenience, sometimes tenants are reluctant to cooperate. It’s an imposition on their time and their personal space, so you need to contact them before running the open house ads in the paper or online. Make sure each tenant agrees to the date and time you’ve chosen for an open house, to avoid surprises and to ensure cooperation. If one or more tenants choose not to leave home during the time an open house is scheduled, most real estate professionals will go ahead with the open house, letting visitors know people are at home. Sometimes an incentive helps you and your real estate broker to get cooperation for open houses and for individual showings. Most tenants welcome gift cards to big box stores or restaurants, or even to food stores. Acknowledging the inconvenience of leaving home during an open house, usually held on Saturday or Sunday afternoons, is a thoughtful way of saying, “Yes, we know this is a hassle. Thanks for your cooperation.” Gift cards won’t be necessary at the time of individual showings, once your tenants know you are showing respect for them, and for their home. Another incentive is a huge fruit basket, including nuts and cheese and chocolate. Everybody loves a fun, thoughtful gift like that. Sometimes there are gift certificates for coffee or pastries included in the gift basket, too. Tenants will appreciate your attention and care. There’s another alternative for selling your rental house with tenants. You can avoid going through the process of notifying tenants to hold open houses or scheduling individual showings. You can avoid waiting six weeks or more to find out if your buyer is qualified for a mortgage. And you can avoid paying real estate commissions or traditional closing costs. Calling SoCal Home Buyers to give you an offer on your rental property can make your rental house sale and your life a lot easier. Even if your rental house needs costly repairs, or if you’re facing foreclosure on it, selling your property directly to SouthernCaliforniaHomeBuyers.com is a real possibility to consider before you list with a real estate broker or start showing it yourself. Once you agree to a purchase price, the sale is guaranteed. No costs or fees are charged to you at closing. The pressure to clean, repair, and remodel is lifted off your shoulders. No fancy staging or professional photos are needed. Your proceeds check is exactly the amount you are offered, provided on your own time frame. Real estate investors have a variety of reasons for buying single family homes, and for selling them when the time is right. If the time is right for you to sell your investment, the costs of liquidating it should be considered whenever you calculate your ROI – Return on Investment. If you haven’t spent the money yet, it’s easy to overlook all the costs involved in selling a rental property with tenants in it. Calculating the market value of your house with tenants is a bit different than determining the market value of a home that is already vacant or will be vacant soon. 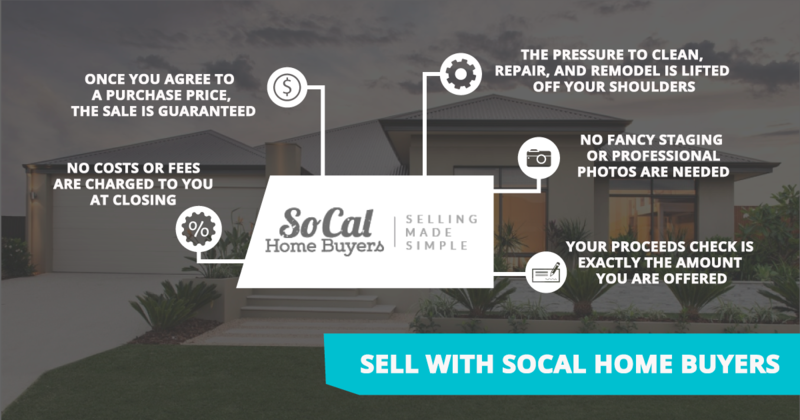 SoCal Home Buyers makes a fair, cash offer that’s a win-win situation for both buyer and seller. If they don’t think their offer is truly a win for you, they let you know, at no cost and with no obligation. The value of your time is a big factor to consider, along with all the other costs involved in selling your property with tenants in it. It may be practical for you to get involved in the marketing process, or you may be better off to call a cash buyer and get a check for the full amount of the selling price you’re offered. What’s your ultimate goal? Getting the right price at the right time for you.